and practically no time in the kitchen. it’s the authenticity of whatever. or smother in kefir for dinner. cus sometimes you just gotta go with it. *note: dw & i dined at eleven madison park for his birthday a few months ago and they gave us their granola as a parting gift. short of going back there to dine, i had to make it at home. their version is sweeter, and initially i would halve the sugar amount, and now i just nix it completely. i think the key is the olive oil and low temp. it is so good, it’s well worth forcing myself into the kitchen to put together. my office sidekick cj swears by it, tells me i need to quit my day job and become a crunchy granola hustler. don’t tempt me. **note: this recipe is for 1 batch, but we typically double it. in a large bowl, mix together the raw ingredients. in a small saucepan, warm the maple syrup and olive oil on low. pour the warmed liquid on the raw ingredients and mix through, making sure all the dry ingredients are coated well. 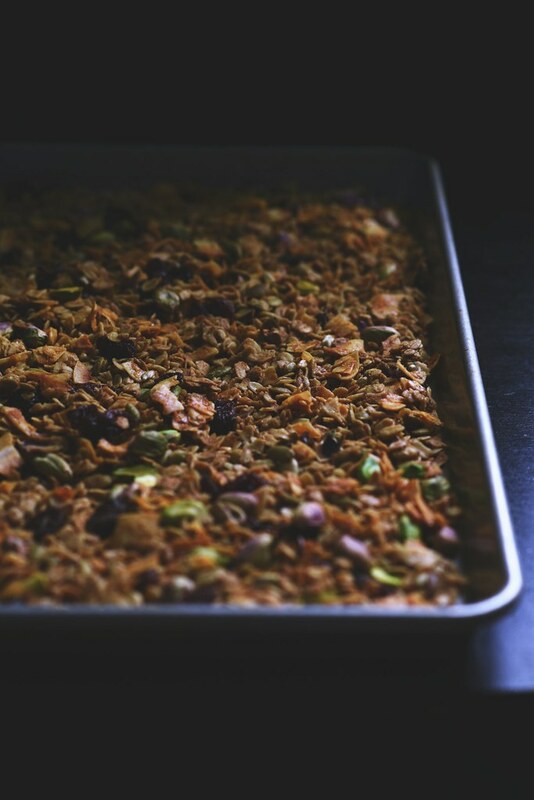 on a rimmed baking sheet, lined with parchment paper, dump the granola on it and spread it out. bake until dry, about 40 minutes. be sure at the half way mark to stir granola around. when the time is up, stir the granola one last time and allow to cool in the oven with the door open. when it’s at room temp add in the cherries or raisins and whatever remaining ingredients that were not raw and mix through. store in air tight containers, will keep for a week or two. we’ve managed to consume within that time frame, so i’m unsure if it’ll keep freshness beyond that. I love EMP granola — something about the olive oil and cherries together. They used to give little boxes of macaron as parting gifts, and I was so happy when they switched to granola (not a macaron person) and I got to cart it home in my luggage for breakfast. i like the olive oil + cherries combo, but the low and slow bake that makes it delightfully crunchy is what makes it for me. i’m so glad they didn’t give us macrons, i’m not big on them either. I’ve made granola with many different oils, even with butter, but never with olive oil. I’m assuming that you mean an oil with a good fruity flavour that you can taste in the finished granola. It’s does sound good, like an olive oil cake but in wholesome, fibrous form. A perfectly acceptable dinner in my humble opinion. honestly, i use whatever extra virgin olive oil that’s on sale at the market. how interesting, making granola with butter. it’s never occurred to me to use that fat. was it super rich? Honestly I couldn’t even tell that it was butter – the recipe didn’t use much so I don’t think it made much difference. It’s a more neutral flavour than coconut oil (which I often use) so that can be a bonus. I’ve been feeling the cooking thing, and the photography thing..but not the writing thing. I have a backlog of things I want to write about but I’m feeling so little inspiration. 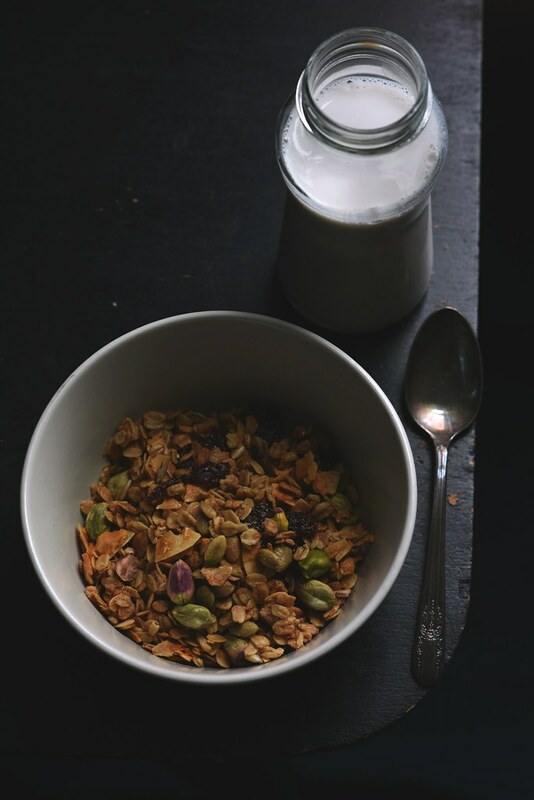 This granola does look smashing, however! 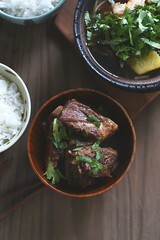 i think i might need to just post pix to blog with recipe and call it day! What a lovely post! And great granola.